Download Kung Fu Panda 2 in Digital HD from the iTunes store. Kung Fu Panda 2 images are © DreamWorks Animation. All Rights Reserved. 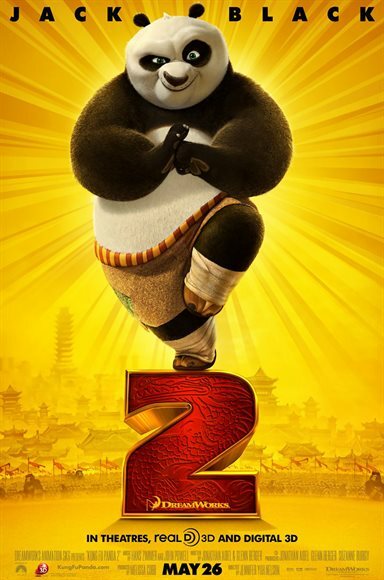 The Dragon warrior is back in the theaters this Memorial Day weekend with the release of Kung Fu Panda 2. The story takes place a little while after the first Kung Fu Panda film (2008). After earning the respect he deserved at the end of the last film, Po (Jack Black), along with the Furious Five -Tigress, Crane, Mantis, Viper, and Monkey have been saving China from the hoards that would threaten its quiet peaceful villages…that is until a banished lord, Shen, rises from the outskirts to take over China. Armed with determination, Po and the Furious Five set out to defend China from Lord Shen and his secret weapon; but unbeknownst to them are Lord Shen and Po have met before. Every year animated feature films continue to reach higher and higher into the sky with their animation and depth used in their storytelling. Kung Fu Panda 2 does not buck the trend and brings computer animated films to new heights with their stylized version of China. It hasn't looked so good since the 2-D Mulan that Disney brought to audiences back in the 1990s. Adding to the film emersion created by Dreamworks animation team, is one of the best 3D films that has appeared yet this year. The third dimension applies a great deal of depth to Kung Fu Panda 2 -- allowing the audience to be entirely immersed in Po's world. While the animation and 3D in this sequel are simply amazing, it is unfortunate that the story sets the film back a bit. While the screenwriters Jonathan Aibel, and Glenn Berger try to create an interesting a tale, it lacks the depth one would come to expect for family films in this day and age. In fact, only when they resort to on-screen slapstick or banter does the film actually gives the audience its monies worth. At the same time, even though Kung Fu Panda 2 has some great voice talents such as Jack Black, Dutin Hoffman, Angelina Jolie, Seth Rogen, and Gary Oldman, their voices fall flat on the screen as it appears the characters are wooden and do not show any emotion. Even though the film lacks somewhat, Dreamworks has nicely positioned Kung Fu Panda 2's release date by being the only true family-friendly film to be out during the long holiday weekend so it should fair pretty well at the box-office. Hopefully, however, this will be the last time we see Po and The Furious Five at our local cinemas.